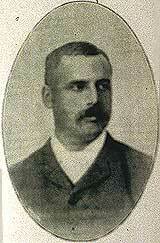 Henry William Whiting (1852-1919) took over Manor Farm in about 1881, aged just 29. He arrived from Hanslope with his wife Mary and the first four of their 11 children. 'Harry' was one of four sons of Joseph Evan Whiting. Together they dominated the farming scene in North Bucks in Victorian times. The other three brothers farmed as the 'Whiting Partnership', but Harry farmed his 385 acres alone, (with the help of 13 farm labourers). He was chiefly a dairyman, he employed 10 men and 3 boys on his land, but he also had a large dairy business in London. He bought dairy businesses; by selling milk, butter, eggs, poultry and bread he increased their value, then sold them for a profit. His descendants believe that his businesses eventually became 'Express Dairies'. The photograph shows him in his fifties. He looks prosperous, confident and energetic. He knew he was an important person in the area and he took care to play his part in the local community. When a Whiting got married it was an important local event. He was a churchwarden at Willen church for 28 years, and was Chairman of the Parish Committee and Overseer of the poor until 1908. When there were special events to be celebrated, such as the Coronation of Edward the VII, he and his family took a leading role in organising suitable events. The Whitings all worked very hard, but they did find time for hobbies. For most Whitings this meant horses, but Harry must have visited London quite often and may have found time to go to the Theatre, perhaps the Savoy, to see a show, such as H.M.S. Pinafore, the latest Gilbert and Sullivan operetta.